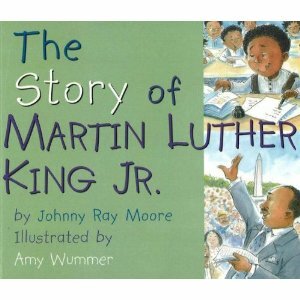 The Story of Martin Luther King Jr. keeps his story very simple and easy to understand for the little ones. It explains that when Martin Luther King, Jr., was a little boy he had to go to a specific school, was not able to eat at any restaurant that he wanted to and had to look for specific water fountains to drink from. It tells of how MLK, Jr. grew up and became a preacher and gave a speech in which he said, "I have a dream that my four little children . . . will not be judged by the color of their skin." Hence, the book concludes that because of Martin and his dream, we are now all able to attend any school we wish, be served at any restaurant, drink from any water fountain and dream any dream. It's very basic which I appreciate for a younger audience. The Story of Rosa Parks is equally straight forward. 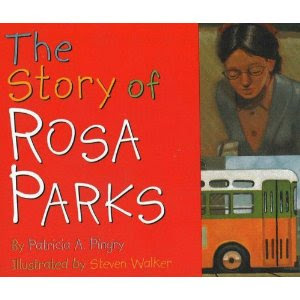 It explains when and where Rosa grew up and how she would ride the bus to and from work. This book tells of how African American people were not allowed to ride at the front of the bus and would frequently have to give up their seats to white people. The young reader learns that Rosa quietly refused to give up her seat one day and the police were called. It follows her case to the Supreme Court where the Court ruled, "that no one could tell African Americans where to sit on a bus." Straightforward and to the point! Again, I appreciate this as we try to explain some hard history lessons (and resulting holidays and observations) to younger children. I've talked about The Story of Valentine's Day before but it's worth another mention in this particular line-up. 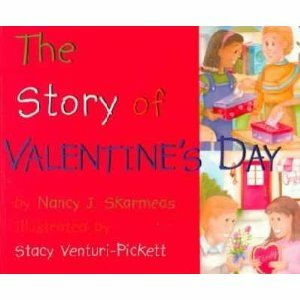 This simply tells the story of Valentine who lived in Rome and was kind to all children. It explains how he was sent to jail for trying to help young men in the army, and women get married over the king's objections. It tells of how the children who knew and loved this man would send him cards when he was in jail and thus the idea of Valentine Cards were born. Definitely a nice little read. If you are having a tough time finding ways to explain holidays to your toddlers or pre-school aged children, you might want to give these books a try. I like that they are informative but don't go overboard in explanations so as to lose the child's attention. We've found these to be a great resource and so we pass along the tip to you! Awww, you make me wish I still had little kids again so I could get these books. :-) Guess I'll have to wait a few (or a lot!) more years on grandkids. Hope you're doing well with your pregnancy! I'm going to be honest - we are skipping right over MKL, Jr. day for now. Right now my kids have no concept of racism. We attend an ethnically diverse church where they are friends with all kinds of people. The idea that people would be divided because of their skin color would be difficult for them to grasp. Frankly, I'm not ready to go there with my young kids. I realize not everyone makes the decision like I have and I respect that. As always, thanks for pointing out high quality children's books, Carrie!! SMB - Yup. I hear what you are saying. It IS a testy subject sometimes and I rather agree that when they are young and don't notice - why point these things out? We're a multicultural family around here and neither boy pays attention to that. It just - IS. I primarily like these books because they are SO basic that it doesn't raise too many deep and compelling questions, but just gives a basic idea of what the day is about for kids who notice that there is a holiday and want to know more. For sensitive ages on a sensitive topic, I think this works. 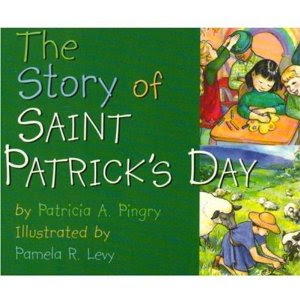 I think I should get the one about St. Patrick considering Noah was born on that day! Super fun! Oh, we loved those little books when Peter was younger. What a great assortment of titles!